Please note that this article is only for educational purposes and I wrote it as it appealed to my intellectual curiosity. Circumventing license policies on Windows operating systems is a violation of Microsoft’s Software License Terms. I do not take any responsibility, and I am not liable for any damage caused through this tutorial. Before we begin, I will try to briefly explain a few jargon. Those of you who are familiar with these can skip directly to the tutorial. Please note that this tutorial is meant for advanced users. If you don’t know how to edit the registry or mount an iso, then this article is not for you. The Virtual Hard Disk (VHD) format is a publicly-available image format specification that allows encapsulation of the hard disk into an individual file for use by the operating system as a virtual disk in all the same ways physical hard disks are used. These virtual disks are capable of hosting native file systems (NTFS, FAT, exFAT, and UDFS) while supporting standard disk and file operations. Native boot enables virtual hard disks (VHDs) to run on a computer without a virtual machine or hypervisor. Booting Windows natively from VHDs is very interesting and useful as they can boot from real PC hardware, allow to install any applications, drivers and updates, and deliver almost the same performance as an operating system directly installed on a hard drive. It allows us to test changes to operating systems on real PC hardware without having to worry about partitioning the hard disk. 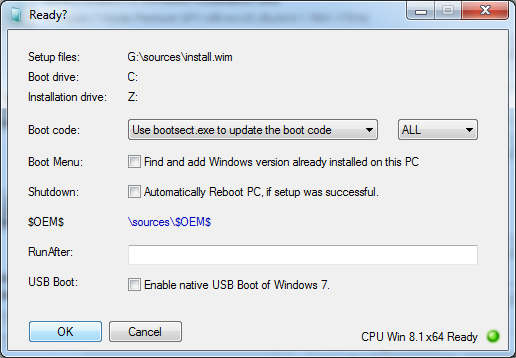 User sambul61 @Reboot.Pro has written some good tutorials on VHD Booting. You can refer to this tutorials for more details on VHD booting. This triggered my curiosity, and I tried to find out what exactly prevents native VHD boot on other Windows 7 versions. 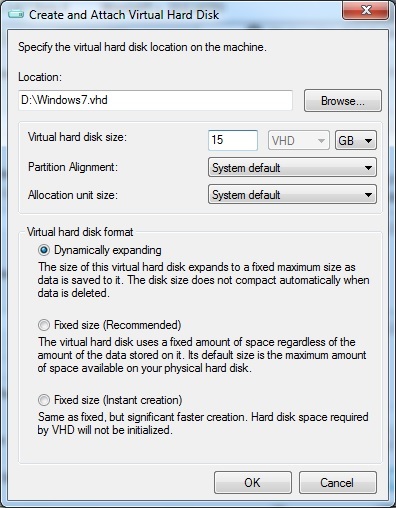 Third party drivers like Firadisk or Winvblock do not support dynamic VHDs; they only support fixed-size VHDs. I used grepWin to search for that error and the I found it in C:\Windows\System32\en-US\winlogon.exe.mui. Mui files are language-specific resource files. So that actual code invoking the Error Message is in winlogon.exe. I used IDA 5.0 Freeware to disassemble winlogon.exe. Since the freeware version supported only 32-bit executables, I extracted the 32 bit winlogon.exe from the Windows 7 SP1 32 bit ISO and used it with IDA. 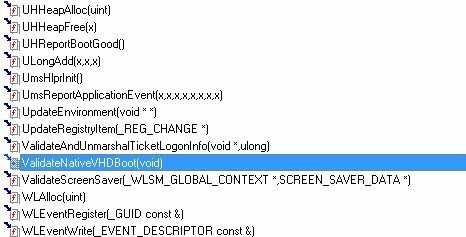 In the List of Functions, I found an interesting function ValidateNativeVHDBoot. After a bit of Googling, SLGetWindowsInFormationDWORD looks in the Registry Key – HKEY_LOCAL_MACHINE\SYSTEM\CurrentControlSet\Control\ProductOptions to get license information. There is a detailed explanation of this in Having fun with Windows Licensing by Remko Weijnen. Using the tool written by Remko, it was evident that Kernel-NativeVHDBoot is set to 1 in Windows 7 Ultimate/Enterprise and is 0 in other versions of Windows 7. This was discussed by Wonko and erwan.l @reboot.Pro http://reboot.pro/topic/15407-booting-from-vhd-in-grub4dos/page-4#entry193599 . 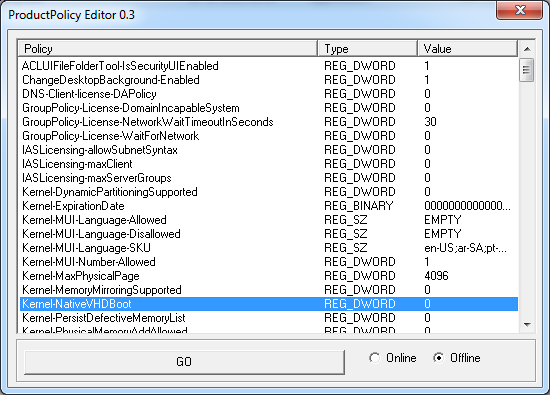 erwan.l created an excellent Utility called ProductPolicy Viewer which can be used to edit the policies of an offline Windows. In short I was able to set Kernel-NativeVHDBoot to 1 in Windows 7 Professional and successfully native boot it from a dynamic VHD without having to use any third-party drivers. The below steps were tested on Windows 7 Ultimate 64 bit. Insert your Windows installation DVD or mount Windows Installation ISO using ImDisk. Download and extract WinNTSetup. Run WinNTSetup_x64 or WinNTSetup_x86 as Administrator depending on your operating system. I ran WinNTSetup_x64 as I am using a 64-bit operating system. WinNTSetup might require some additional files. So when prompted, say ‘Yes’ so that it can download the necessary files. Select the location of Windows Installation files – choose the sources folder in your Windows Installation DVD or mounted ISO. Select the location of Boot Drive – Your Main Hardisk. Select location of the Installation drive – Your VHD Drive. Right click on the VHD and disable the VHD checks. Click on Setup and click on OK to start the installation to the VHD. Once the process completes, reboot the computer and boot from the VHD. WinNTSetup should have created an entry for VHD in the Boot Manager. Allow the setup to complete. After you create your Username, password, select Timezone, etc, and when you try logging in, you will the get “License error: Booting from a VHD is not supported on this system”. Reboot into the VHD and you should now be able to login. Reboot into the VHD. If you get the get “License error: Booting from a VHD is not supported on this system”, then that means the Software Protection service had reverted the Policy changes before you stopped the service. So you will have to repeat step 9 and 10 to reenable the Kernel-NativeVHDBoot policy. You now have a Windows 7 Professional or HomePremium booting natively from a VHD! !